Santa Claus is coming to Cobb! Santa Claus is coming to Cobb! And in the case of Town Center, he’s already here for all of you early birds who want your photos and Christmas cards ordered before Thanksgiving! These are his traditional, long-term locations, but he’ll also make special appearances at many of our local events, which you can find here. Town Center at Cobb Mall: 11/1/15 – 12/24/15. Times vary by date. He’ll be there through Christmas for the usual visits and pictures, but there is also Caring Santa on November 22 and December 6. This is a special opportunity for children with special needs and their families. The event is held before the mall opens for a calmer atmosphere, and special care will be taken to support the sensory, physical and other developmental needs of children. There are also three dates when you can get photos with your pets! Cumberland Mall: 11/21/15 – 12/24/15. Check out dates and times here and take note of the special pet nights if you’d like to bring your 4 legged child this year. This year you can make a reservation, and skip the lines and save as much as 30% on photo packages. Santa House at Aunt Fanny’s Cabin, Smyrna. Weekends in December (starting December 4), with a special appearance on Monday, December 21 and Tuesday, December 22 for last minute gift requests. Young children and the young at heart may hand deliver Christmas Wish Lists to Aunt Fanny’s Cabin (located on Atlanta Road across the street from the Market Village) and have a private conversation with the jolly old elf himself. See link for times. This event is co-sponsored by the Smyrna Optimist Club and the City of Smyrna. * Special Note: This is a wonderful opportunity for the children to sit with Santa in a more personal and relaxed environment than you’ll find in the malls, however, the photos are taken by a volunteer and a single shot is printed on site. If your focus is on the photos (different poses, multiple prints, electronic files, etc) you will do better at the mall for photos. If your focus is on the experience, this is a great Santa to visit. Santa’s Workshop, Marietta Square. 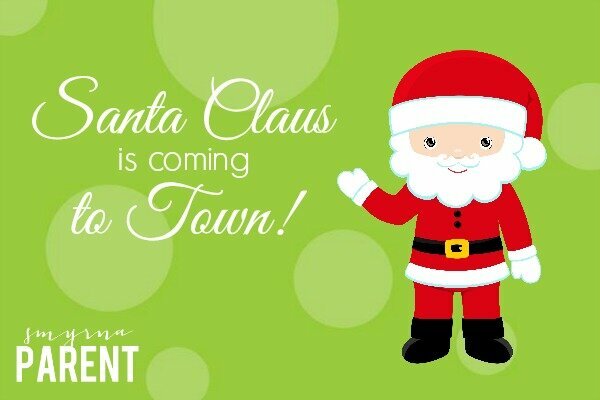 Santa will be available at the Square on Saturdays and Sundays in December, plus the Monday, Tuesday and Wednesday Christmas week. While there, plan to visit the open air ice skating rink and the shops on the Square for unique gifts and holiday treats. Enjoy hot chocolate or a sandwich at one of the many restaurants. Thanks for sharing this, Alicia! We are looking for sponsors, toys and donations. Help make this Christmas season bright this year, and bring joy to children in need. Santa’s Coming To Cobb Event is like no other celebration. It is a winter wonderland that is a part of every child’s dreams. Santa flies in by helicopter bringing toys and Christmas excitement. Every Child gets a gift and picture with Santa. There are many Christmas activities for families do to from petting zoo, bounces, games, live music, local youth performances, and real snow.